It wasn't a normal Sunday however, it was jinxed Sunday. In the morning I was confronted with the fact I am just a village-man in the city. Innocent, I parked my car twice on the sidewalk (once in front of a bakery to get some bread and the second time to load my raceboard on the roof). However the city parking officers weren't amused, and gave me a ticket, a good reminder that this behaviour is absolutely not allowed in the city of Amsterdam. At Muiden I actually didn't move anymore (visual at least). My speed was below 2 km/h. A new personal best I guess ;). I sat down on my board, still very positive laying in the sun (I thought this should be fun once the wind turns on). 10 minutes observating around me I started to doubt the windprediction, another 5 minutes later I thought I better get back (because 5 km swimming takes a long time).. Guess what is the fastest way to move (almost) without wind on a raceboard? pumping, rotating the sail in a forward motion. The thing learned was: with pumping you can go double or triple the windspeed on a raceboard (on a crosswind course). 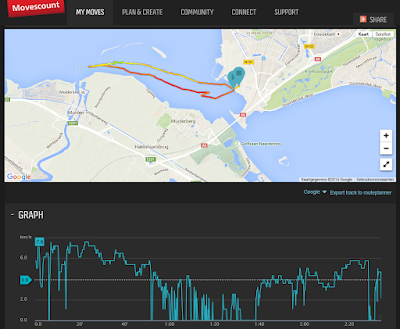 A worst-case scenario (middle IJsselmeer) where you have to surf 10 km in 2 kn wind would take 2.5 hours. A long time, but not impossible or dangerous.